W. Harrell Everett, Jr. was a founding partner of Everett, Womble & Lawrence. After 53 years of practice, he retired from the firm in August, 2015. He passed away on August 16, 2018. He was born on Christmas Day in 1934 in Williamston, N.C. to William Harrell and Serena Peacock Everett. He graduated from Williamston High School, and received undergraduate and law degrees from the University of North Carolina, and was an avid UNC sports fan. He served in the U.S. Army between undergraduate and law school. 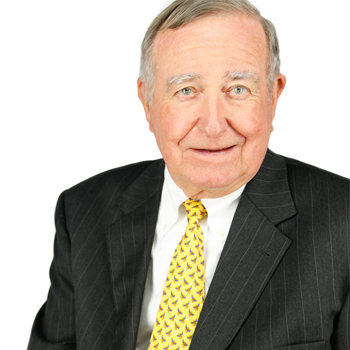 Harrell began practicing law in 1962 in Rocky Mount, NC, and moved to Goldsboro in 1964, where he practiced law until 2015, including serving as City Attorney of Goldsboro for 35 years. Harrell served his community and church in many ways, including Senior Warden and Treasurer of St. Stephen’s Episcopal Church, President of the Goldsboro Chamber of Commerce, President and Paul Harris Scholar of Rotary, member of the Goldsboro City Schools Board of Education for eight years, Chairman of the Wayne Mental Health Board, President of the local Wachovia Bank board, and member of the North Carolina Job Development Investment Grant (JDIG) committee. Harrell was the reason we are Everett, Womble & Lawrence, and he will be missed. We are proud to continue his legacy.